I try and get the kids in the mix, too! 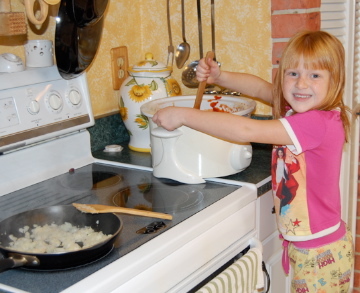 Here’s my baby 3 years ago helping me make some chili! Pretty much all my recipes are stolen. Yup. I’m fessin’ up. I steal other people’s recipes. Family, friends, strangers, internet, I’m open to all recipes! The kicker is…..I share them, too! We all get in a rut from time to time and I love trying new things out—especially if we are having guests! My “passion” leans more toward baking (probably because I have such a sweet tooth), but I’m always up for new dinner recipes to mix it up during the week, keep the kids guessing. We aren’t a spicy family and I will almost ALWAYS tweak a recipe to make it my own (mostly out of rushing and failure to fully follow a recipe or missing an ingredient–whatev, that’s the beauty of cooking! ), so feel free to improvise and make any of these YOURS! And don’t forget to share!